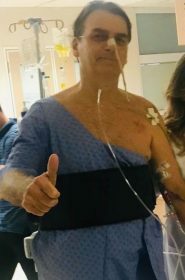 Brazil’s President Jair Bolsonaro thumbs up as he is hospitalised at Albert Einstein Hospital in Sao Paulo, Brazil, February 7, 2019. Brazilian Presidency/Handout via REUTERS ATTENTION EDITORS – THIS IMAGE HAS BEEN SUPPLIED BY A THIRD PARTY. BEST QUALITY AVAILABLE.